« Canine Teething: The. Worst. Lots of sports stadiums are creating suites for nursing moms. Which is awesome! These suites have space to nurse, change diapers, or even pump. Reports on the nursing suites indicate high usage, too, because moms who are made welcome to see to their babies’ needs can now attend hours-long sporting events without worry. The Cincinnati Reds suite is used by 40-60 moms each baseball game. So. Women in Pittsburgh have been requesting a space in Heinz Field to accommodate nursing or pumping. The NFL has rules about buying tickets for all humans, even tiny babies, and many moms are opting to leave their babies at home. This often means needing to pump at football games. The Steelers have one of the largest female fan bases in the NFL, so it makes sense that a lot of these women would be nursing their babies at some point in their fandom. But that’s not what I want to talk about today. I want to talk about the comments on the newspaper article discussing the requested space. Not only the comments on the article itself, but the comments on facebook and other online discussions about the article. The comments are threatening, rude, enraged, misinformed, shaming…any other negative adjective you could think of. And a lot of them? They’re coming from other women. I know, I know. Never read the comments. But it’s really hard not to in this case, even if I’m observing them as a sociological phenomenon. This isn’t the first time I’ve seen women shaming other women, calling them “entitled” or implying that breastfeeding is indecent. When I was writing about The Milk Truck for Bust magazine, artist Jill Miller observed that almost all the vitriol she experienced was from other women. Women seem to be the biggest culprits putting other women down for their choices. As a woman, I know that it can be important to feel like fellow women at the very least don’t hate what I’m doing. To know there are other women, other mothers, lurking out there fully enraged at the thought of breastfeeding makes me sad. 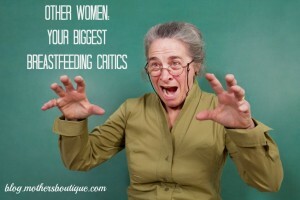 Certainly the only negative feedback I’ve ever gotten regarding breastfeeding or pumping has come from other women, including the time I was hounded by an angry mob of women when I had to pump in a theater restroom. Our society treats young families terribly. We have no paid leave to accommodate birth, we have very little medical support for lactation, and a cultural habit of actively shaming women for making a healthy choice for their babies. The Surgeon General of the United States put out a cry to support breastfeeding as a public health initiative, and women are called ignorant and entitled when they bravely answer this call. I’d like to challenge us all to support nursing moms whenever we can. Let’s give a thumbs up to a nursing mom this week, or a high five, or even just thank her for making a healthy choice for her family. Let’s be the voice of love in a world filled with really angry haters. We can make our voices louder than the angry ones and hopefully convince them to take their poison elsewhere. Have other women ever shamed you for breastfeeding or pumping? Leave us a comment to share your experience.